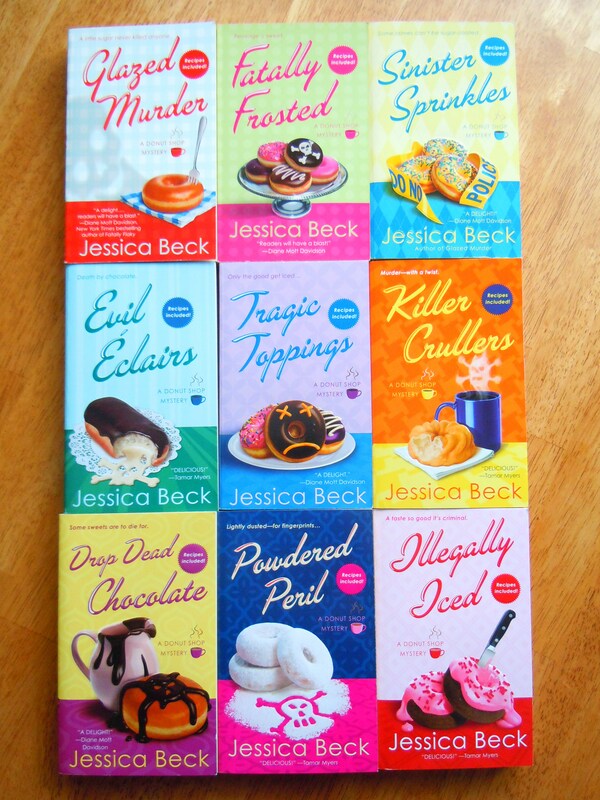 The Donut Shop Mysteries by Jessica Beck! This past week I made a startling discovery: I am THISCLOSE to running out of precious real estate on my bookshelf. Translation? I’m going to have to figure out, in Sheldon Cooper’s words, “a new organizational paradigm” or stop buying books. Yeah, that’s not an option. New organizational paradigm it is. I know this won’t be easy but there’s just no other way around this snafu. I love books too much to stop buying them. I just bought 5 Nancy Drews yesterday from a used book sale to add to my collection for goodness sake. 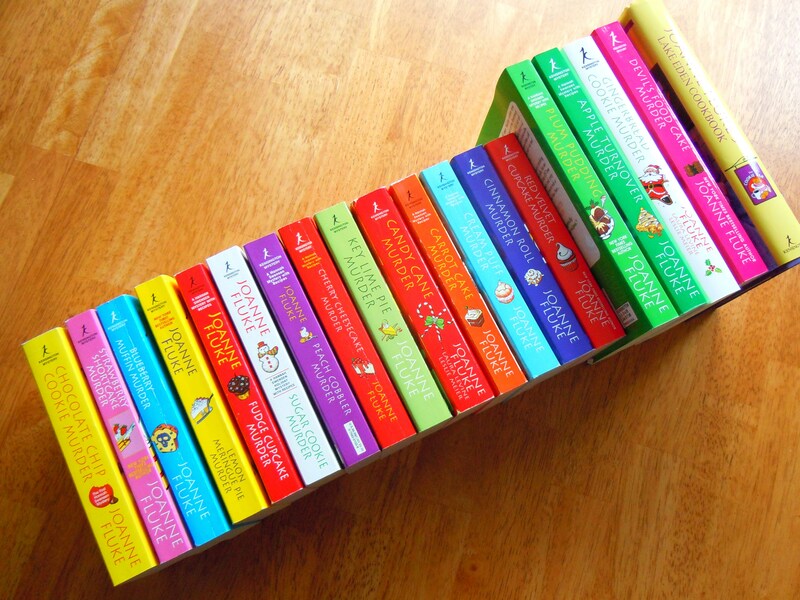 And I know off the top of my head there will be 3 new books coming out this year for a few of my favourite series. Not to mention there are plenty of books that I haven’t gotten around to buying yet (and series that I haven’t even gotten around to reading/starting/collecting yet, like the Coffeehouse Mysteries by Cleo Coyle or the Orchard Mysteries by Sheila Connolly) because I believe in pacing myself. So before anyone says, “oh, well, that’s easy, just get a kindle/kobo/e-reader/whatever other tablet device that’s available out there and you won’t run out of space” I should warn you that if you dare to utter anything even remotely close to that sentence I will chase you down with a wooden spoon. I don’t do e-readers. End of story. So, how did this mini bout of panic over bookshelf space come about in the first place? 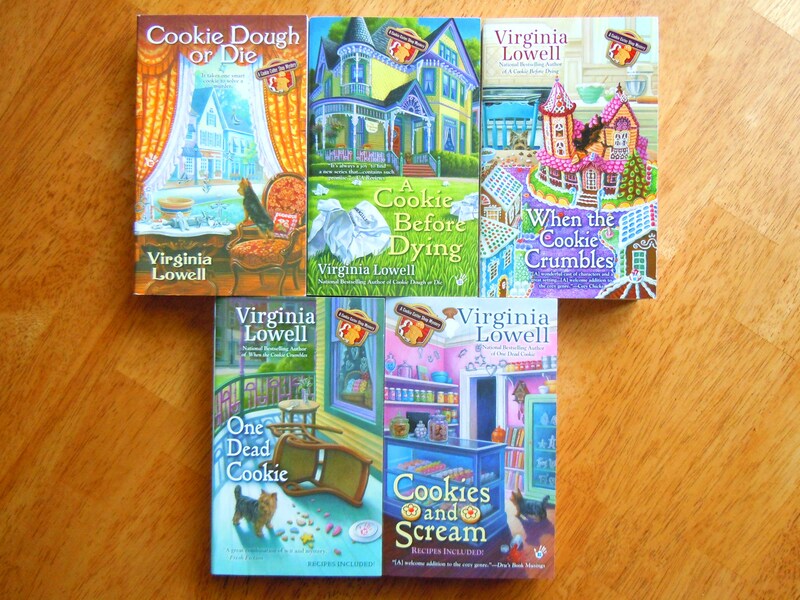 After posting the recipe for the Twin Chocolate Delights cookies from Joanne Fluke’s Blueberry Muffin Murder last Friday and tweeting about the first book of the series being made into a tv movie (I was so excited that I squealed after finding out about this), I received a very enthusiastic response from friends who were really intrigued by the foodie murder mystery genre. 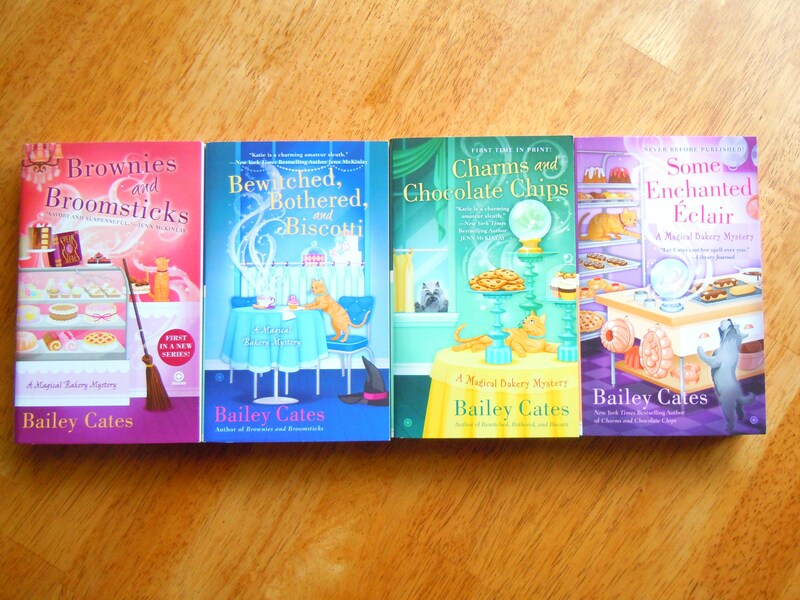 Being the aficionado that I am, I started yammering about how much I loved the series and mentioned how I read and followed a number of other foodie murder mystery series. Well, that just opened up a can of worms: “There are other series? !” and “Wait, this [genre] is a thing? 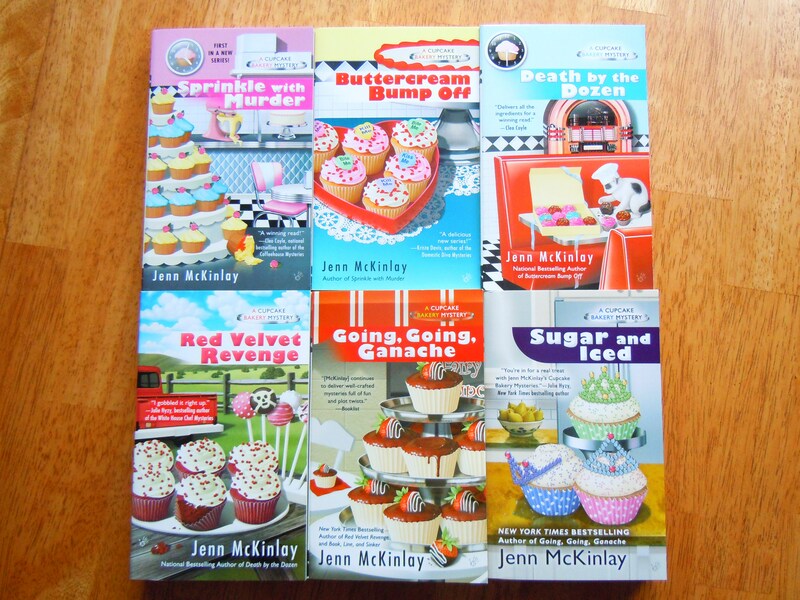 !” I haven’t posted about my love for the foodie murder mystery genre in a long time so it’s understandable folks may not have seen those posts. So I took inventory of my growing collection and took brand new photos to show you all. 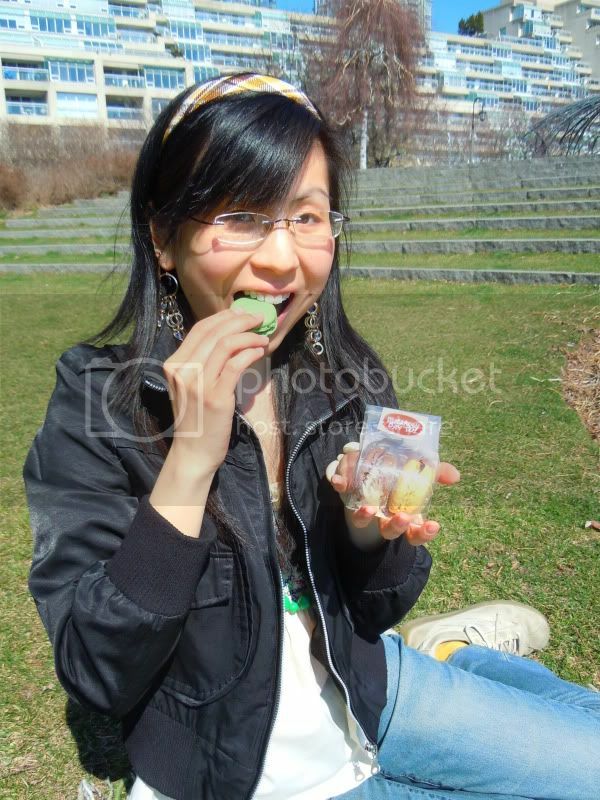 And that is when I realized I really needed to reevaluate things! I am queen of organization and squish though so I have no doubt I’ll come up with a solution to remedy the situation. Here is my book collection in all its glory and may new ones find a comfy space on my bookshelf in my soon-to-be new “organizational paradigm”. 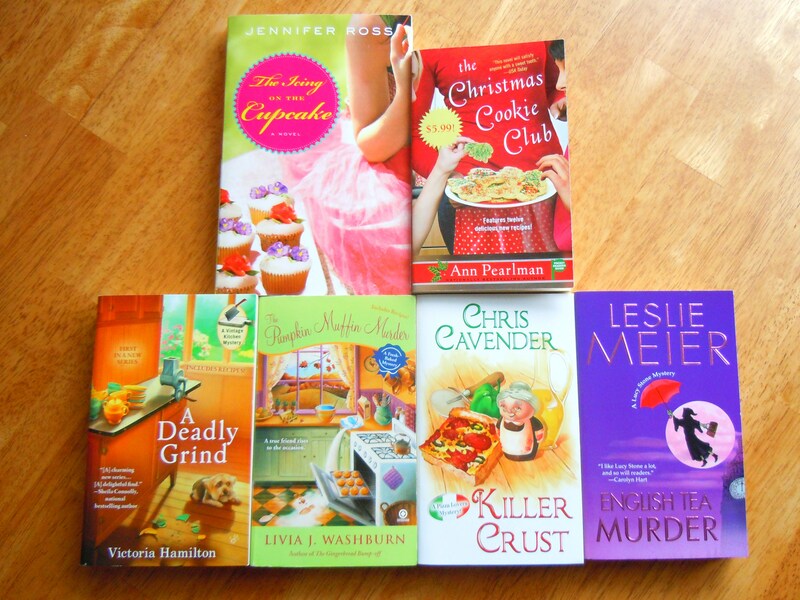 and while the Icing on the Cupcake and the Christmas Cookie Club aren’t mysteries, they are food-themed and they are wonderful novels that I adore to itty bitty pieces and I highly recommend both if you love food as much as I do. 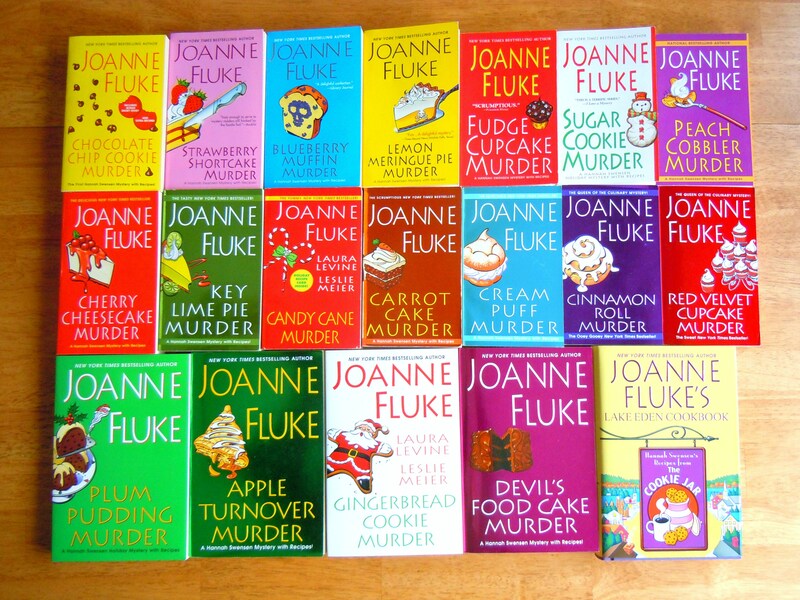 And finally, my beloved Hannah Swensen Mysteries collection by Joanne Fluke! 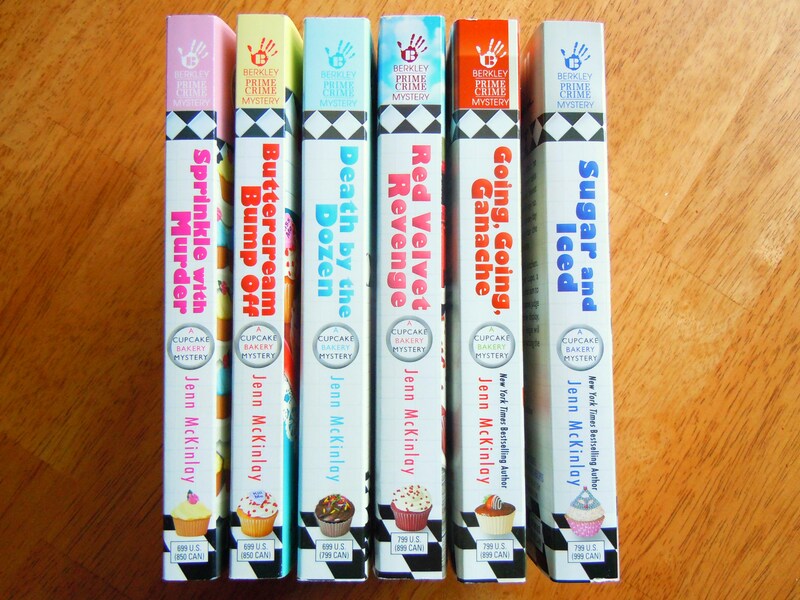 This is, hands down, my favourite foodie murder mystery series and one of my all-time favourite book series in general which is saying a lot because I am a die-hard Baby-Sitters Club, Sweet Valley, and Nancy Drew fan! 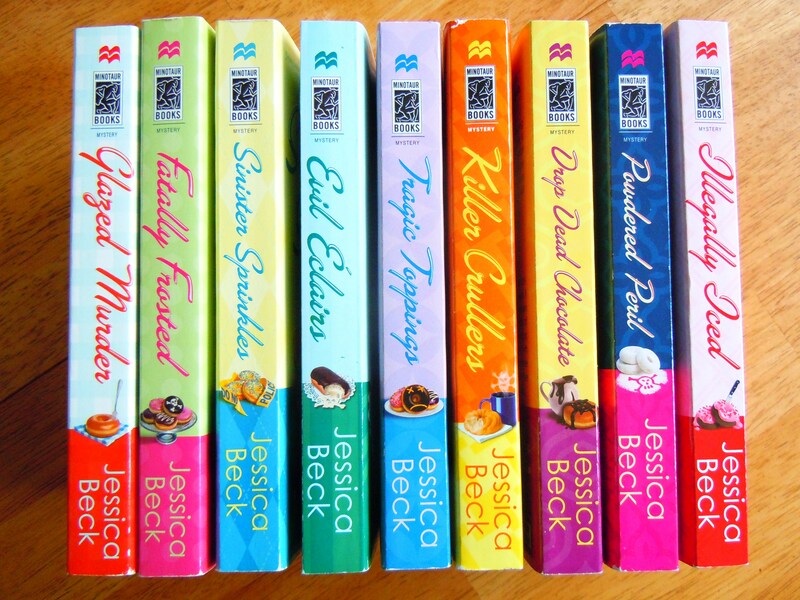 I love these books like crazy and I get so excited every time a new one is released. 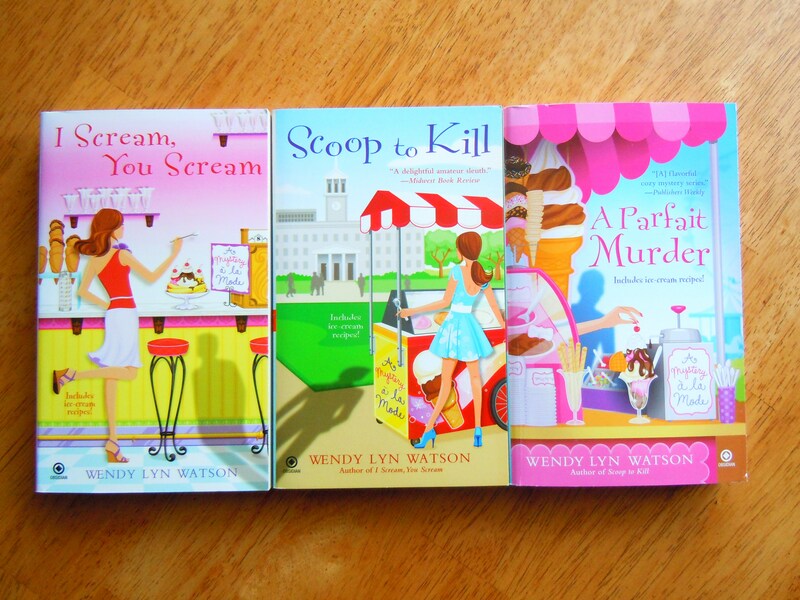 I am waiting with baited breath for the latest one, Blackberry Pie Murder, to be released in paperback at the end of the month and for the newest one in the series, Double Fudge Brownie Murder, to come out next month in February! ← Just When You Thought You Couldn’t Love Chocolate More – A Recipe for Twin Chocolate Delights Cookies! Georgs Kolesnikovs asked me to get in touch. We’d like to make sure you’re fully acquainted with plans for the 2016 Great Canadian Cheese Festival. In addition to the event, we can set up interviews with the attending award-winning cheese makers at the Festival. Here’s an idea for a promotion you might like to undertake: Benefit your readers, build loyalty, say thank you to your supporters – and help more people get to the Cheese Festival. Publish a dedicated promotional code so that tour readers/followers can obtain a 20% discount on tickets purchased online. That’s 10% off the regular price for admission. Get 25% off admission tickets for The Great Canadian Cheese Festival by entering a promotional code you would request from me before starting your online ticket order at http://cheesefestival.ca/tickets/. Good only on tickets purchased online in advance of the Festival on June 4-5. Visit http://cheesefestival.ca for information on the Festival. Go for the day or make a weekend of it! If I can help in any other way, just let me know.